In essence, the higher-than-expected amount of heat in the oceans signals that global warming itself is more advanced than scientists thought. Over the past quarter century, the Earth’s oceans have retained 60 percent more heat each year than scientists previously had thought, said Laure Resplandy, a geoscientist at Princeton University who led the startling study published Wednesday in the journal Nature. The difference represents an enormous amount of additional energy, originating from the sun and trapped by the Earth’s atmosphere – more than 8 times the world’s energy consumption, year after year. In the scientific realm, the new findings help to resolve long-running doubts about the rate of the warming of the oceans prior to the year 2007, when reliable measurements from devices called “Argo floats” were put to use worldwide. Before that, different types of temperature records – and an overall lack of them – contributed to murkiness about how quickly the oceans were heating up. The higher-than-expected amount of heat in the oceans means more heat is being retained within the Earth’s climate system each year, rather than escaping into space. In essence, more heat in the oceans signals that global warming itself is more advanced than scientists thought. Wednesday’s study also could have important policy implications. If ocean temperatures are rising more rapidly than previously calculated, that could leave nations even less time to dramatically cut the world’s emissions of carbon dioxide, in hopes of limiting global warming to the ambitious goal of 1.5 degrees Celsius (2.7 degrees Fahrenheit) above pre-industrial levels. The world already has warmed 1 degree Celsius (1.8 degrees Fahrenheit) since the late 19th century. Scientists backed by the United Nations reported earlier this month that with warming projected to steadily increase, the world faces a daunting challenge in trying to limit that warming to only another half degree Celsius. The group found that it would take “unprecedented” action by leaders across the globe over the coming decade to even have a shot at that goal. “In case the larger estimate of ocean heat uptake turns out to be true, adaptation to – and mitigation of – our changing climate would become more urgent,” said Pieter Tans, leader of the Carbon Cycle Greenhouse Gases Group at NOAA, who was not involved in the study. “(It) does have implications for climate sensitivity, meaning how warm does a certain amount of CO2 make us,” Russell said, adding that the world could have a smaller “carbon budget” than once thought. That budget refers to the amount of carbon dioxide humans can emit while still being able to keep warming below dangerous levels. The U.N. panel of climate scientists said recently that global carbon emissions must be cut in half by 2030 if the world hopes to remain beneath 1.5 Celsius of warming. But Resplandy said that the evidence of faster warming ocean “shifts the probability, making it harder to stay below the 1.5 degree temperature target. Understanding what’s happening with Earth’s oceans is critical simply because they, far more than the atmosphere, are the mirror of ongoing climate change. According to a major climate report released last year by the U.S. government, the world’s oceans have absorbed about 93 percent of the excess heat caused by greenhouse gases since the mid-20th century. Scientists have found that ocean heat has increased at all depths since the 1960s, while surface waters also have warmed. 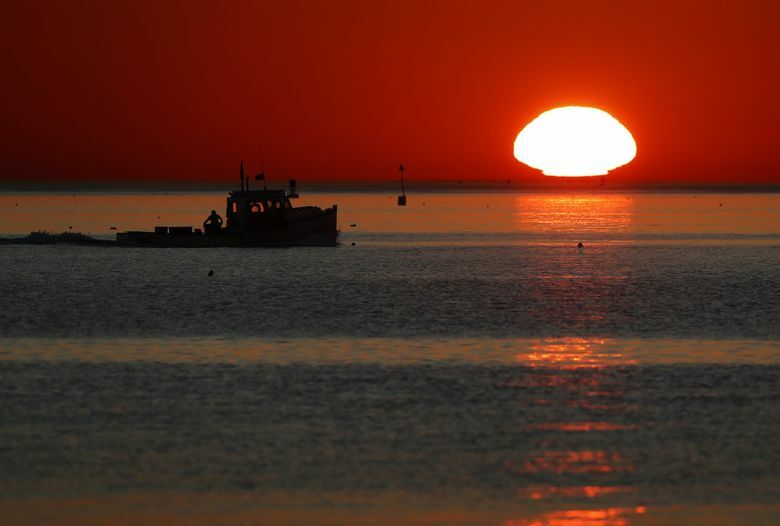 The federal climate report projected a global increase in average sea surface temperatures of as high as nearly 5 degrees Fahrenheit by 2100 if emissions continue unabated, with even higher levels of warming in some U.S. coastal regions. The world’s oceans also currently absorb more than a quarter of the carbon dioxide emitted annually from human activities – an effect making them more acidic and threatening fragile ecosystems, federal researchers say. “The rate of acidification is unparalleled in at least the past 66 million years,” the government climate report stated. The warming found in the study is “more than twice the rates of long-term warming estimates from 1960s and 70s to the present,” Durack said, adding that if these rates are validated by further studies, “it means the rate of warming and the sensitivity of the earth’s system to greenhouse gases is at the upper end.” He said that if scientists have underestimated the amount of heat taken up by the oceans, “it will mean we need to go back to the drawing board” on the aggressiveness of mitigation actions the world needs to take promptly to limit future warming.